One of the best things Ubisoft has done in recent years (besides giving birth to Assassin’s Creed) was to reboot the Rayman series. The developers must have realised that Rayman’s true strength had always been the excellent platforming action. And so they released a graphically super impressive 2D platforming game with great controls, great gameplay and a very unique soundtrack called Rayman Origins. 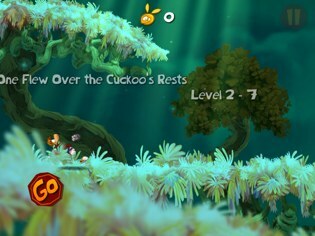 Luckily, Rayman Jungle Run for iPhone and iPad has a lot in common with its bigger console brother. It looks just as beautiful and is a very polished, very fun game. 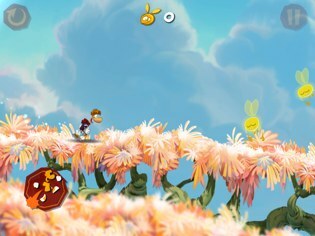 The biggest difference is the gameplay; while you have full directional control in Rayman Origins, Rayman Jungle Run is an on-rail game where you only need to help Rayman avoid various obstacles. You’ll be doing this by simply tapping the left side of the screen to jump and fly, and the right side of the screen to punch. In the first few levels, all you need to do and worry about is jumping. The game will then introduce you to the concept of floating and finally into punching stuff. This is done very intuitively and creates a very nice learning curve. At first I was a bit worried that Rayman Jungle Run might be too easy because the first few levels were no real challenge at all. I was proven wrong pretty soon when I tried to complete one of the challenge levels that you first need to unlock before you can play them. I probably tried that level about 50 times and have yet to complete it. The game is split into four chapters with ten levels each. 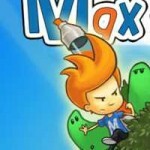 The levels are full of coins that, if you wish to collect all 100 per level, you often have to find secret passages for. Collecting all 100 coins in a level will gain you a special zombie tooth. In each of the four chapters there is one special challenge level that can be unlocked by collecting five of those teeth. 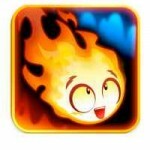 All of the levels have a very distinctive art style and look and feel very different. But while they all look different, they also all look equally gorgeous! 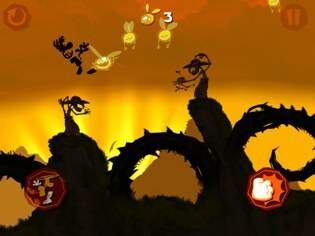 Rayman Jungle Run really is a beautiful game! So it looks as good as Rayman Origins, but unfortunately it doesn’t sound quite as good. 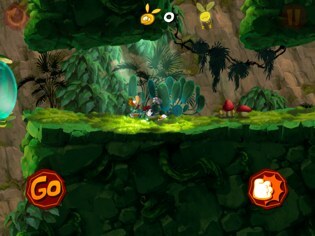 The music in Rayman Jungle Run is very similar, but it does sound very repetitive and might get on your nerves pretty quickly. It doesn’t help that there isn’t a huge variety of songs either. But compared to how much fun I had with this game overall, I can forgive the weakness in the music department. So my verdict is quite clear: If you like beautiful and challenging platforming games on your iPhone and iPad, there’s really no way around buying Rayman Jungle Run. For what it offers I also consider it a steal!